Now, I’ve never seen the show Felicity before. I know my sister used to love it. But when I picked up Ultra a few weeks ago, I thought, “I bet this is the Felicity of comic books”. Essentially, it’s like a comic book chick flick for guys written about girls, but written by guys. And really, what do comic book nerds know about girls? 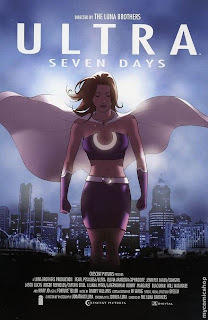 Ultra is a story that centers around a female superhero named Pearl Penalosa, or better known as the titular, Ultra; she’s sort of like a female Superman. It takes place in a world where superheroes are treated like celebrities, which includes their own “talent” agencies and award shows. The superhero aspect and crime fighting is secondary, if not tertiary, to the main story which is more romance-centric. The story focuses on her struggle that I’m sure resonates with a lot of young readers. She’s a young person with everything that she wants, fame, money, good looks. In that sense, she has it all except the one thing that truly matters to her: love. I don’t know if it was done purposely, or if this stemmed from writer Joshua Luna’s experience (or lackthereof) with girls, but girls don’t talk like the ones that exist in this story’s universe. It made me wonder whether he has any female friends. Or maybe he does and they talk like this. And if that’s the case, how did he not rip his ears out? Despite all that, it’s a really fun read and welcome departure from all the crime graphic novels and Batman books that I’ve been reading lately. Love stories are fun. Love stories about superheroes are even more fun. If you’re expecting some epic scope by the end of the story, you will be sorely disappointed. The story doesn’t involve any grandiose, world-in-danger sort of storylines. It’s focused on the character. The book was published by Image Comics, and was almost completely done by a duo known as the Luna Brothers. The art style that they’ve adopted looks really clean on print, with an almost anime-like style of illustration and colouring. The brothers have said in interviews that they prefer concentrating on female characters in their stories, and it shows. All the girls in this book are drawn beautifully. But it’s a bit disconcerting, in that their style is so female-oriented that even a lot of their male characters look feminine. I think there were two occasions where I couldn’t tell whether a character was a guy or a girl. I think one of the cooler aspects is that each issue/chapter is separated by cover art that mimics popular magazines. On top of that, at the end of each issue/chapter is a fake magazine article or column that centers around the superhero life. It’s done similarly in the Watchmen as a way to flesh out their world. As I mentioned earlier, it’s a fun, short read. For comic book geeks who think about love, it’s an almost must-read. Until next time, later geeks!